Can We Predict CWD Occurrences? 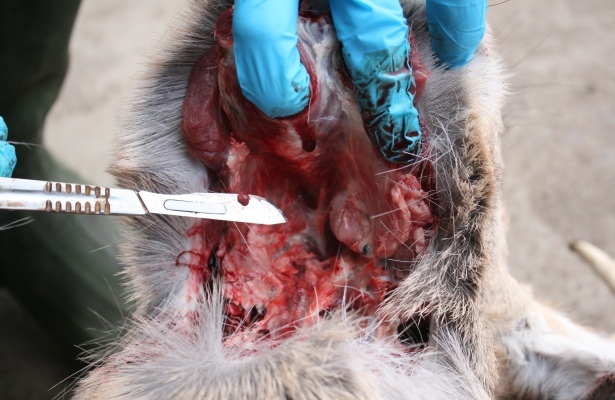 Currently, the only way to accurately test a deer for CWD is through lymph nodes which are extracted after the animal is deceased. Biologist in many states will sample thousands of hunter-harvested deer every year to monitor the disease. Without a doubt one of the hottest topics in the deer community right now is Chronic Wasting Disease (CWD). At one time, only a rare occurrence was found in Western deer herds. CWD is now found in many states east of the Mississippi River, including some of the perennial “big buck” producers. It’s no surprise with the attention and concern revolving around the disease that there is a lot of research being conducted by professionals. These researchers are trying to clear the air about CWD and, more importantly, provide solutions or recommendations to minimize its effect. One of the universities providing this research happens to be my alma mater, Pennsylvania State University. The first case of CWD in Pennsylvania was just recently discovered on a deer farm in the fall of 2012. The disease was discovered in free-ranging deer later that hunting season in two counties. However, the surrounding states of Maryland, West Virginia, and New York all have had deer that have tested positive as early as 2005. It wasn’t a matter of “if” CWD was in Pennsylvania but “when” it would be found. In an effort to understand CWD, the Pennsylvania Cooperative Fish and Wildlife Research Unit at Penn State has begun to study the disease’s occurrences in the region. One of the latest studies makes a pretty bold claim stating that they have identified a relationship between terrain features and CWD occurrences. Seems too good to be true, however, I think that there are some conflicting issues to this claim based on the information that has been made available to the press.Researchers collected geographic locations from hunters that harvested deer that were later identified to be CWD positive. They then overlaid these data points on a map with a variety of habitat and landscape features. The analysis showed that there was a strong relationship between CWD positive deer and low-lying, opened and developed areas. Seems possible, right? Here’s the issue: Stating this is where CWD is likely going to be “attracted” is a BIG claim. My question is simply this. Where do most deer hunters actually hunt? I say that because I believe this research is severely biased. It is a known fact that most deer hunters do not hunt far from roads, which usually yields easy access to open and likely developed areas. This same research unit published a paper in 2005 that stated, “… deer hunters were nearly three (3) times less likely to hunt in an area for every increase of 500m from a forest road.” Meaning, people do not go far from roads when deer hunting. They go on to say, “… for every 5 degree increase in slope, an area was 1.5 times less likely to be hunted.” So more hunters are in low-lying areas. More hunters available to harvest deer in these areas means more deer likely harvested, which can lead to more CWD-positives found because the sample size is larger. Maybe we aren’t getting all the facts, and maybe the steep, forested terrain had just as many hunters and just as many deer harvested. That’s one for the authors to bring to the table. For now, my thoughts are still that CWD is unpredictable and only through proper controlled management and regulations can we minimize the effects. Whether you hunt the valley or the summit, it’s possible to find a CWD-positive deer.